The whole point of 3D is immersion. The technology wants to create a 'real' space for you to engage with. So it follows that if a 3D screen is big enough to fill your field of vision, it's more likely to deliver an immersive stereoscopic experience. Especially if that size is accompanied by the full HD resolution that's fuelling the new 'frame sequential' 3D push. With this in mind, Panasonic's TX-P65VT20B is a seriously tantalising prospect. After all, it combines the biggest yet seen on a 3D TV with full HD frame sequential playback. What's more, it uses plasma technology, which on the evidence seen so far uses its faster response time versus LCD technology to great effect when reproducing 3D images. The P65VT20 isn't as glamorous as I'd like, though. In spite of its bronze finish, it's a bit chunky and staid in its sculpting. But it does have both Freeview HD and Freesat HD tuners, meaning you can get HD broadcasts regardless of where you live in the country. The set also has the Ethernet port required by both the UK's free HD broadcasting platforms for future interactive services, and this can also access DLNA PCs or Panasonic's so-so VieraCast online platform. More multimedia strengths come via a pair of USBs and an SD card slot, with playback of photo, music and video files (including DivX HD), and even lossless recording of the TV tuners to Buffalo's JustStore Desktop HD-EU2-UK USB HDDs. The USB ports enable you to make the TV Wi-Fi ready via a dongle that's included in the box. However, it's not as elegant a solution as a built-in system. Pictures are driven by multiple video processing tools, such as Panasonic's powerful V-real Pro 5 3D engine and 600Hz sub-field drive for producing smoother, sharper motion handling and enhanced brightness and saturation. Not to mention the brand's latest NeoPDP screen technology, which promises to deliver enhanced colours, black levels and sharpness, as well as an extra tweak, exclusive to the VT20 series, that reduces the plasma cell decay time – an essential improvement for tackling the dreaded 3D crosstalk phenomenon. More on this later. Third-party endorsements abound: THX provides a well considered picture preset, while the ISF has certified the screen as being possible to calibrate by one of their experts. This gives some idea of the level of picture tuning flexibility the P65VT20 affords. Highlights include a colour management utility; various gamma presets; the ability to adjust or deactivate the set's Intelligent Frame Creation frame interpolation system; and Panasonic's new Resolution Enhancer system for boosting the sharpness of standard definition sources. The TV ships with two pairs of Panasonic's 3D glasses, which feel uncomfortable rather quickly and let an annoying amount of light in. So much so, that you need to darken your room as much as possible when viewing in 3D. This situation is reinforced by the way the TV loses considerable brightness in 3D mode versus its LCD rivals. Just lift your glasses while watching some 3D content and you'll be startled by the brightness gulf. Just as well, then, that the P65VT20's immense black level response versus LCD rivals ensures that 3D images still look reasonably rich and dynamic. From here on in, though, the P65VT20's 3D efforts really improve. Their single most important achievement is how little they suffer from crosstalk. The TV certainly isn't immune to the tell-tale double ghosting of objects in the mid-to-far distance; actually, we felt the P65VT20's size made what crosstalk problems the screen does suffer more obvious than they were on the smaller 50in P50VT20. But the issue is far less common or obvious than you find with any active LCD 3D TVs. This immediately makes the P65VT20's 3D pictures both more convincing and less tiring to watch than those of any other 3D brand. The reduction in crosstalk also helps the set deliver impressively on frame sequential 3D's promise of full HD resolution with 3D sources. 3D Blu-rays such as Monsters Vs Aliens look superbly detailed and crisp. In fact, the TV's 65in screen size helps it produce the most convincing demonstration yet of exactly why the frame sequential 'active' 3D approach is worth pursuing over the lower-res, passive method. The P65VT20's sheer enormousness does, it must be said, ram home the resolution difference between full HD 3D Blu-rays and Sky's side-by-side 3D broadcasts. But the latter's images still look impressive for the most part, despite their reduced pixel count. Switch the P65VT20 to 2D mode (it doesn't carry any 2D-to-3D conversion circuitry), and it continues to impress. 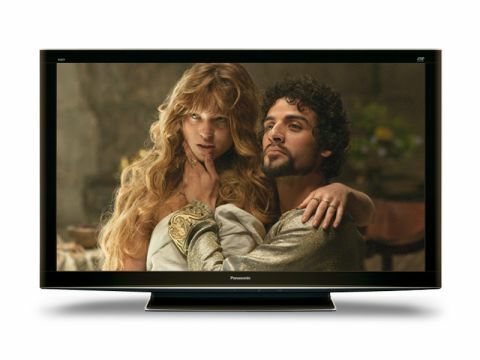 HD pictures look consistently outstanding, with the massive screen emphatically delivering on Panasonic's plasma black level advantage, while also producing superbly natural, subtle colours. High-definition images look terrifically crisp and detailed, too. The P65VT20 doesn't just excel on films and TV either. Its rendition of the relentlessly dark Alan Wake on Xbox 360 frequently took my breath away, for instance, on account of its outstanding black level response. Shifting my seating position around reminded us, too, of just how convenient plasma TVs are, since they don't suffer from reduced picture quality with wide viewing angles. In theory, if the P65VT20 was going to have a major weakness, it would be with standard-definition sources. But in practice they're really not at all bad. The upscaling engine suppresses source noise without leaving the image looking overly soft, and unlike many LCD TVs and previous Panasonic plasmas, the P65VT20's colour palette doesn't go awry when shifting down from hi-to standard-def. That said, this is clearly a TV that's tailored to showcase high-definition, so I'd strongly recommend that you keep it on a Full HD diet as much as humanly possible. Really my only issue with the P65VT20's pictures, beyond the occasional (but good vs LCD) 3D crosstalk issues, is the very rare appearance of gentle fizzing noise over skin tones during horizontal camera pans. A final surprising strength of the P65VT20 is its audio. The set carries three speakers in a 2.1 configuration, delivering 10W to each, and this helps it produce a soundstage that's wide, dynamic and powerful enough to accompany the king-sized screen. The TV is overall another superb set from Panasonic. Its contrast, sharpness and sheer size make watching it a wonderfully cinematic experience, and while there's room for improvement, it also serves up the best 3D pictures currently available.